Just how extreme was Colorado's record-setting rainfall? The torrential rainfall that inundated Colorado for the better part of a week has finally cleared, leaving eight confirmed dead and 1,600 destroyed homes in its wake (see images from the initial flooding here). 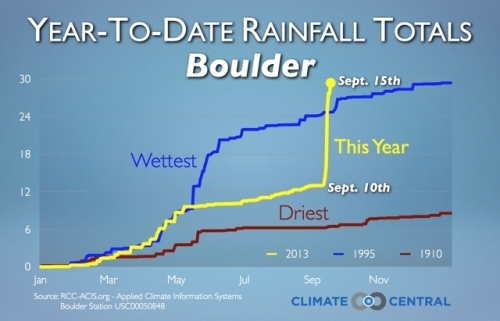 Yesterday, meteorologist Robert Henson told Climate Central, the city of Boulder officially set the record for its rainiest year in recorded history. Five days in the past week set individual rainfall records, while the 9.08 inches that fell on Sept. 12 shattered the previous single-day record, set in 1919, of 4.08 inches. For this much rainfall to hit the county was only about .1 percent. 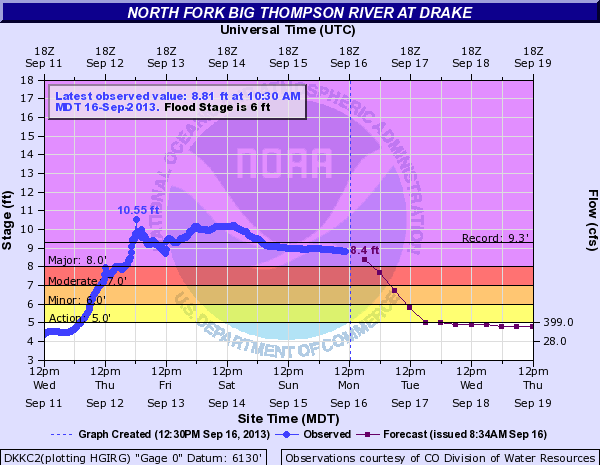 Calling the past week a 1-in-1,000-year event is a rough estimate, said Henson, given the scarcity of historical records and population shifts that have made such floods, when they occur, more likely to cause damage. We can no longer say such weather is unheard of, but as the state's recovery efforts begin, it will hopefully remain unusual.